In the first installment of the Project Manager’s Guide to Extraordinary Projects, we discussed initial client interactions and how to choose the best client for your company. Now that you have found that perfect client, you’re ready to dive headfirst into an exciting new project. But wait, there is one last thing you need in place before you start wireframing, open up Sketch, or write that first line of code. The contract. Unless you are a lawyer, the contract phase is probably the least exciting stop on the road to an extraordinary project. At times I liken the contract stage to waiting on the tarmac at the airport after you’ve boarded the plane and about to take off for a week long vacation. You’re bursting with energy, excited to start living it up. Just then, the captain comes on the loud speaker and says your flight will be delayed due to inclement weather. Web design contracts and negotiations can be tedious and can dampen the energy of a project. However, they are crucial to success and will protect you and your company if things take a wrong turn during the project. 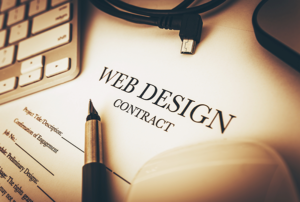 Are web design contracts necessary? Absolutely! The goal of a contract is to protect both parties in the event that someone doesn’t hold up their end of the bargain. We all wish we could take people at their word. But the reality is you need to take steps to make sure you’re covered if disaster strikes. Secondly, outlining a project’s scope, requirements, and deliverables in a contract can set everyone’s expectations. The client knows what to expect from you. And you’ll know that they’ll be providing feedback on your work and paying you when they say they will. When both parties are secure in their arrangement and free of worry and doubts, you’d be amazed at the kind of creativity and energy that can be generated at the start of a project. Where do I get a contract? Now that you are aware of the importance of a contract, what do you do if you don’t have one? If you’re just starting out doing freelance work or thinking about starting your own company it’s likely you don’t have a standard contract. Many sites on the internet offer standard contracts that you can download for free. Sites like AIGA.org have web design contracts that you can download in PDF form and can even include helpful tips about customizing a standard contract to fit your needs. However, if you’re going to be negotiating a contract more than once, its probably best to help you with a web design contract that suits your needs. Use my contract, no use mine Once you are armed with a solid contract you can feel more confident about entering into an arrangement with a client. Some companies don’t have consulting agreements already drawn up, so having yours handy can certainly save some time. But what do you do if your client has a standard contract of their own? More often than not established companies will come to the table with a standard contract already in hand. While this is expected, you need to be aware that the terms of your client’s contract could be structured in their favor. If you’re unsure what a particular clause or section in a legal document means, don’t sign it until you’ve asked your client for clarification and/or had the document reviewed by a lawyer. The saga continues… While contract delays can stall a project, it’s important that you do your best to protect your business and your work. Once you have your agreement in place you can actually start producing and making your client’s vision a reality. In Part 3 of the Project Managers Guide to Extraordinary Projects we cover two things that will either make your project or break it. That’s right, we’ll be talking about creating a project schedule and setting project milestones. Did you like that article? Sign up for our weekly newsletter and we’ll send a new one to you every Friday. 🙌 When you subscribe to our newsletter, you’ll get the inside scoop on all the latest happenings around the 45royale camp. More importantly, we’ll send you resources to help refine your own design and development process, harness agility in your creativity, and stay inspired to meet your work with fresh eyes. Sound good? Giddyup!